"When we thought about where it was going to sit, it was really important to me that it face the water," says Erasmus. 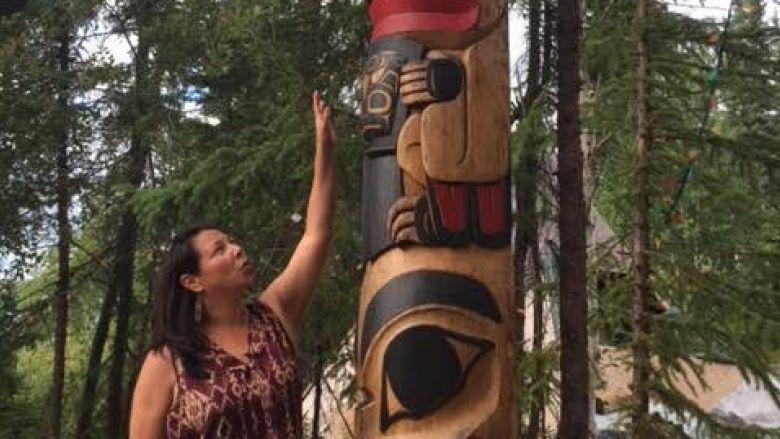 "In B.C., I know that the totems are on the water edge to guide people as they boated in, so when they would see a totem they would know they were closer to home — they would know which clan area they were in, they would know which tribal area. They would give them some indication and some identity. "I wanted it closer to the water so that boaters could see it but I also wanted it as a protection for our family as well." On top sits a bald eagle. Underneath that, a man holding a shield for protection. Then a killer whale and a raven at the bottom. It was hand-carved by a Haida Gwaii artist, Jesse Jones. "It also faces southwest which is where B.C. is, and this is where she comes and so she faces her home as well." Erasmus is a member of the Na-Cho Nyak Dun First Nation from Mayo, Yukon. Her father's family is from Fort Chipewyan, Alta. For 17 years, she's called Ndilo her home. Now, it's Jonee's home. The totem pole made the journey from Grande Prairie to Ndilo in a crate and on a trailer, driven by Erasmus's sister. 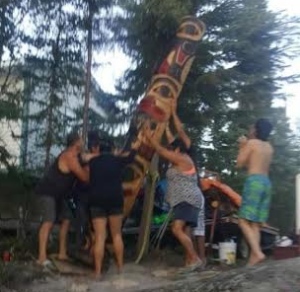 During a family gathering on Monday it took five adults to raise, using straps, and was then bolted into the bedrock. 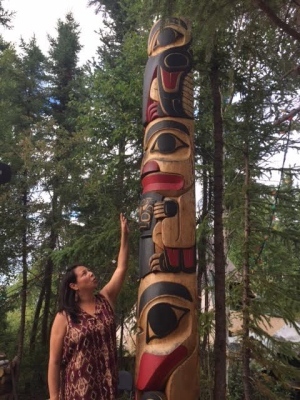 Is it common to name a totem pole? Erasmus doesn't know. But she says, "I knew it was a girl. I knew it was a feminine energy that came with it. It was a protecting energy that came with her and I felt that right away. Responses to "Haida totem pole raised to preserve ancient tribal traditions"